Are Hot Air Balloons Safe ? Hot air balloons operate on the very basic scientific principle that hot air rises. Many people practice ballooning as a sport, and some people also enjoy it as a relaxing recreational activity. Many naturally beautiful regions offer hot air balloon tours so that people can see the land from above. Generally speaking, hot air balloons are quite safe, and certainly more safe than some forms of aviation. Before examining the safety of hot air balloons, it may help to understand how they work. Each hot air balloon has a large bag called an envelope, attached to a sturdy gondola or wicker basket. In order to get enough lift, the air in the bag is heated with the assistance of a flame. As the air heats up, the balloon rises. The pilot can control the ascent by opening a valve to let air off, causing the balloon to drop again. When the flight is over, the pilot slowly lets out enough air to allow the balloon to drop to the ground. Like hang gliders and kites, hot air balloons travel with the wind. Pilots have some control over their direction through their altitude, as different air currents run in different directions. Typically, pilots choose the early morning hours to fly, since wind speeds are still low. Low wind speeds make hot air balloons much safer, and the flights are more enjoyable, since the balloon gently drifts, rather than being buffeted along. The weather is the most important concern in hot air balloon safety. High winds and extreme weather such as sleet and snow are potentially very dangerous. An experienced pilot will not fly in these conditions. Good pilots also always check their equipment before beginning a flight, and they often carry backup tanks of fuel and other redundant equipment for safety. Generally, pilots who want to fly hot air balloons must get a pilot's license. This requirement varies in different nations, but in many countries there are specific courses and examinations which pilots must take to handle hot air balloons. A private license allows a pilot to fly with a few friends, while a commercial license permits a pilot to fly larger balloons and receive financial compensation for his or her time. Balloon rides can be great fun, and they are very safe as long as passengers follow the directions of the pilot. People who experience vertigo or fear of heights may want to skip the experience, however. A hot air balloon is a relatively simple craft. 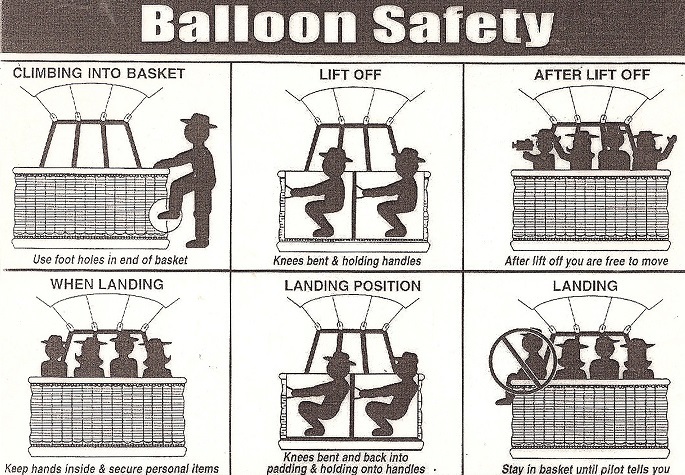 To help ensure the safety of pilot and passengers, a hot air balloon may carry several pieces of safety equipment. A secondary source of ignition is a very important piece of safety equipment. Each burner is equipped with a small pilot light which burns continuously. If for any reason the pilot light fails the pilot need to be able to relight the main burner. Most burners are equipped with a built in piezo sparker but piots generally carry a spare in the form of a welding torch flint sparker or a piezo electric barbeque ignitor. Many systems, especially those that carry passengers have completely redundant fuel and burner systems: two or more fuel tanks, connected with separate hoses, which feed two or more distinct burners. This enables a safe landing in the case of a failyre somewhere in one system or if a system must be disabled because of a fuel leak. A fire extinguisher suitable for extinguishing propane fires is a useful piece of safety equipment in a balloon. Most balloons carry a 1 kg AB:E type fire extinguisher. A handling or drop line is mandatory safety equipment in many countries. It is a rope or webbing of 20 - 30 metres in length which is attached to the balloon basket with a quick release connection at one end. In very calm wind conditions the balloon pilot can throw the handling line from the balloon so that the ground crew can safely guide the balloon away from obstructions on the ground. The pilot should wear flame resistant gloves made of leather or some more sophisticated material, such as nomex. These will enable the pilot to shut off a gas valve in the case of a leak even if there is a flame present. Gloves also provide protection against freeze burns from liquid propane. Clothes made of natural fibers are recommended for the pilot and passengers. These will singe and not burn readily if brought into contact with an open flame. Many synthetic fibers, unless especially formulated for use near flame or high temperatures like nomex, will melt onto the wearer and can cause severe burning. Hearing protection is recommended for anyone that is regularly exposed to burner or inflation fan noise.